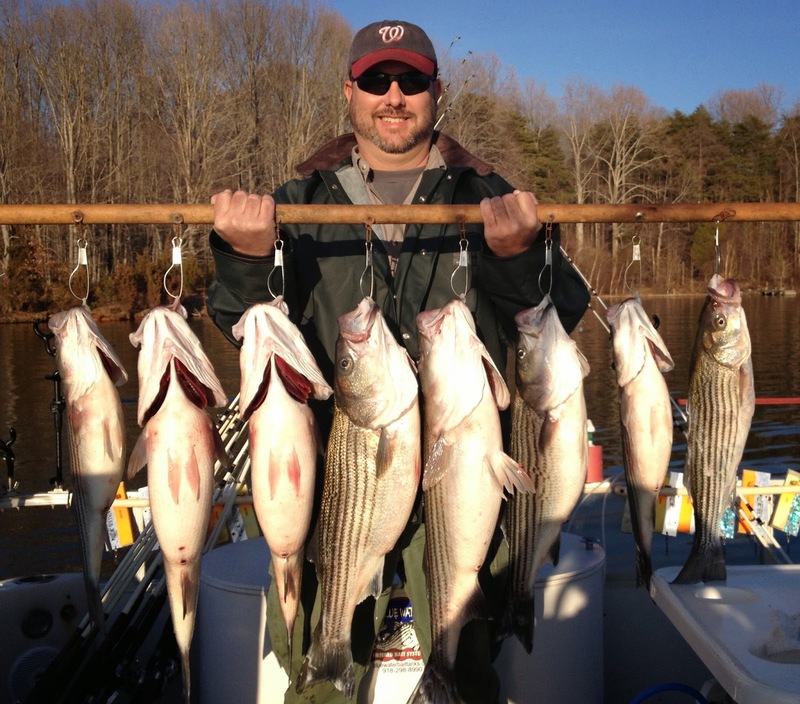 Lake Anna Striper Guide Journal: Finally got back out, Oh what a day! Total Chaos.....Every rod went down and we had to throw the fish into the boat and grab another and another. Rods and fish scattered from one end of the boat to the other. This is just a pic of the front of the boat! 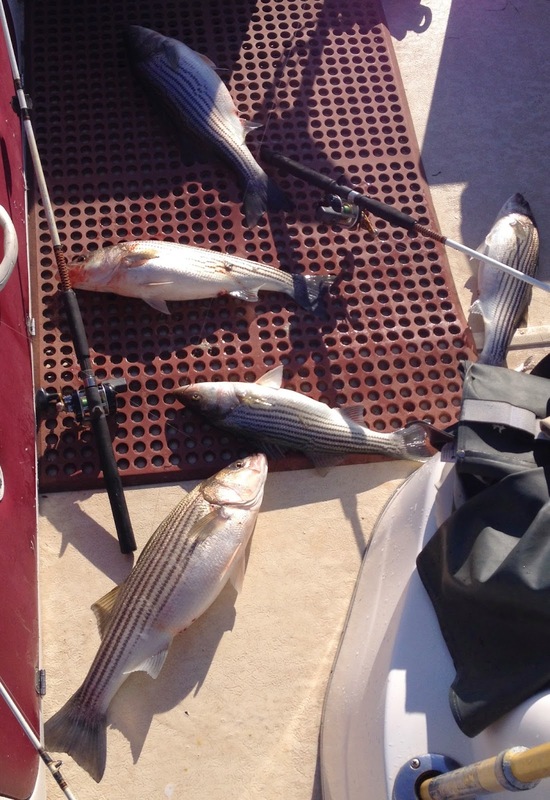 Since it was early in the day we released all of these Stripers and they all happily swam away. We left this school and went looking for other patterns. This is a school of Crappie on the left and some predator fish on the right . were Citation size. Would have been a massive stringer. This is a great shot from my Simrad, probably one of my most favorite shots that I have taken on the unit. I have the screen up top in Green on Side Scan. We had located pods of nice Stripers very deep in the afternoon in little depressions in 50 to 60 feet of water. After seeing numerous pods like this we put downlines out 2 to 6 feet off the bottom and hit some of the pods. The bottom 2/3rds of the screen is my echo page which on the left side I have on bottom lock showing the bottom water column up to 8 feet off the bottom. 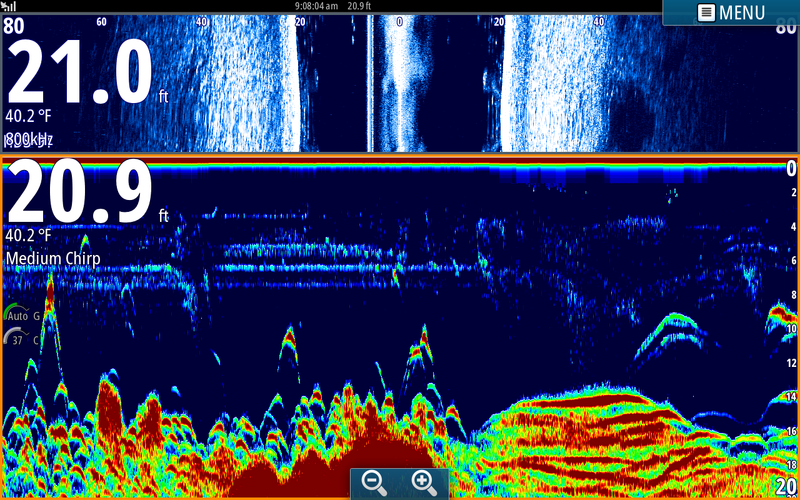 The right side of the screen is regular sonar set to a 50 foot scale. On the right you can clearly see all my downlines being pulled just off the bottom. Then towards the extreme right we come upon a pod of Stripers. 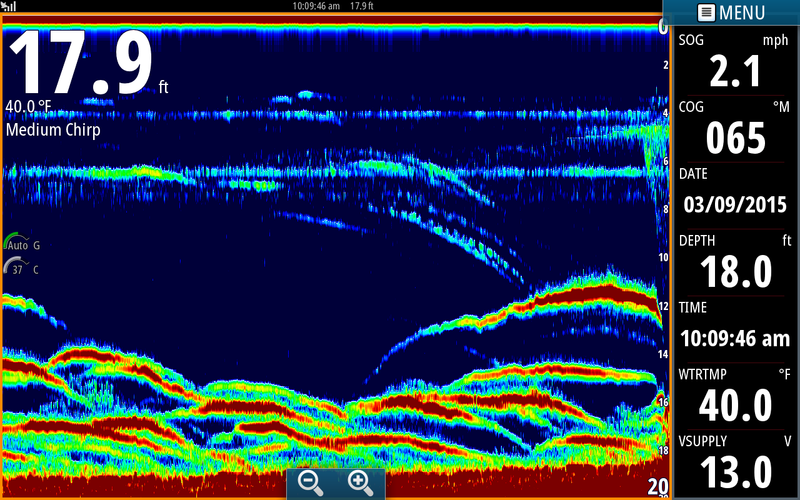 Immediately all the lines get hit and you can clearly see us fighting the fish as we reel them up toward the surface. 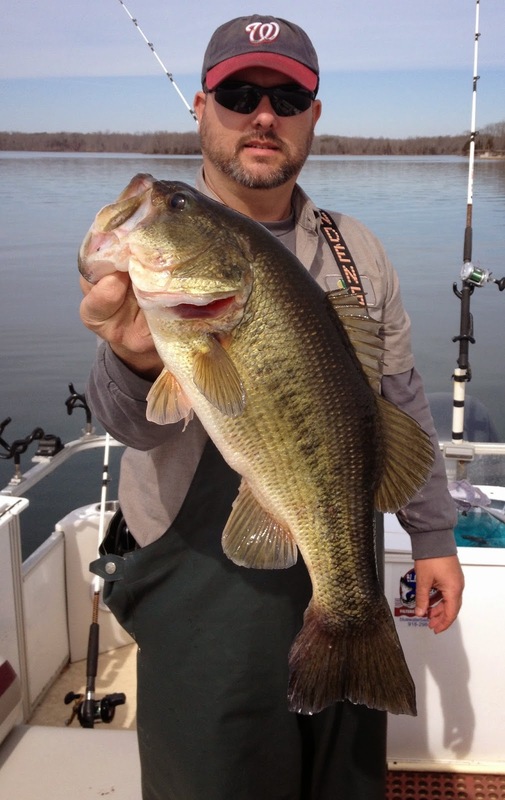 Notice all baits hook up! 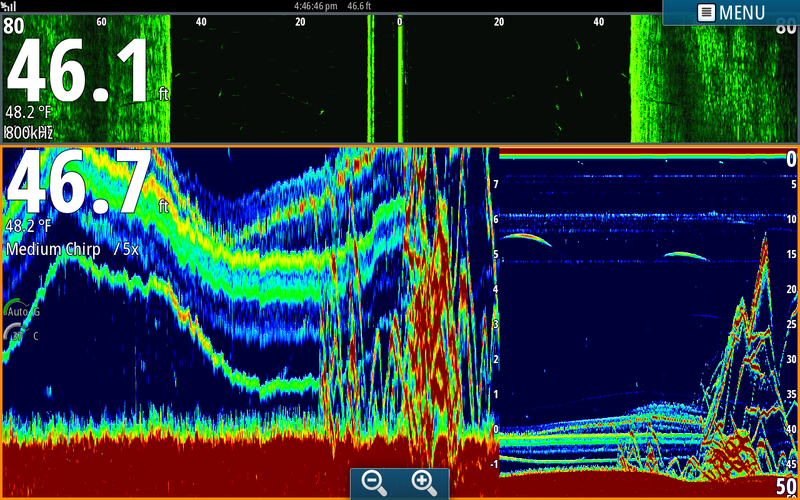 Chirp sonar is INCREDIBLE! With chirp I can monitor all my lines and bait off of one transducer in the rear of the boat. The separation and clarity is off the charts! I can actually view my baits swimming in fifty feet of water. The baits swim up and down as you can see on the bottom lock. When they get around fish they swim frantically until they meet their maker. We boated the eight fish DP is holding in the top picture off of this set, took a picture and called it a day. I popped the screen shot when all 8 rods were bent over. We were lucky to boat all the fish without loosing any or tying any lines up. WOW, I am still high after a trip like that. DP with the smallest Bass of the day. Awesome, What's the water temp your way? Awesome fish! Looking forward to our upcoming outing at the end of the month!